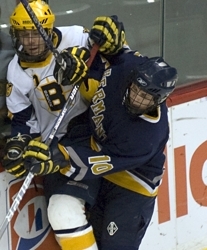 Hard-hitting Jared Thomas is second on Hermantown in scoring with 51 points (Photo by Tim Kolehmainen). This wasn't supposed to happen. It wasn't supposed to be this easy. After losing 14 seniors from last year's Class A state runner-up, Hermantown should have had to endure a rebuilding year. The Hawks had a few talented veterans returning, sure, but most of the team had to make the big jump up from JV hockey. So what happened? Hermantown (20-3-2) instead reclaimed its position among the best teams in Class A and earned the No. 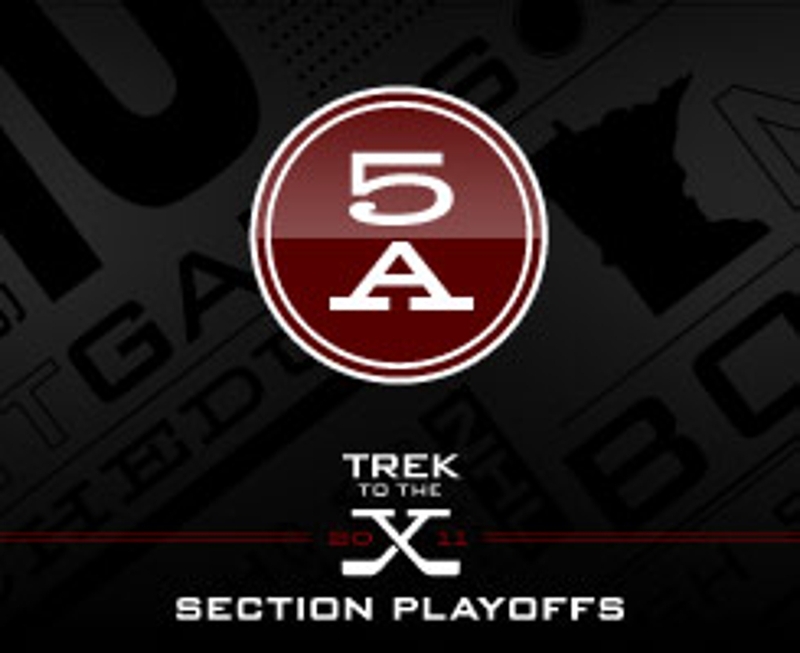 1 seed in the upcoming Section 5A playoffs. The Hawks look just as dangerous as last winter, but with a different crew leading the way. Ask Hermantown coach Bruce Plante and he'll tell you it wasn't as easy as it may have looked. It took a while for the Hawks to jell, but while that was happening, returning veterans such as Garrett Skrbich (37-24-61) and Jared Thomas (24-29-53) carried the scoring load and defensemen Brian LeBlanc (6-20-26) and Jared Kolquist (5-14-19) stabilized the defensive zone. The emergence of Connor Lucas (16-3-2, 2.31, .902) between the pipes has been big, as well. The senior isn't big (he's listed at just 5-foot-6, 150 pounds and that's stretching it), but he plays like it. 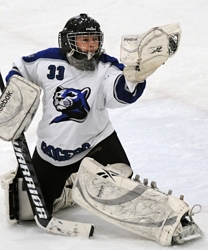 His finest game may have been one of his losses, as he faced 54 shots in a 5-4 overtime loss to Eden Prairie on Feb. 1. There is no question that Hermantown is good. The question in Section 5A is, can anyone else challenge them? Rogers goaltender Keaton Mumm watches the puck into his glove. Both Royals' netminders have save percentages well over 90 percent (Photo by Tim Kolehmainen). And the answer begins with No. 2 Rogers (16-8-1), the unbeaten champions of the Mississippi 8 Conference. The Royals are still a relatively new program when it comes to high school hockey, but they're building quickly under coach Tim Marchand. Rogers is 13-3-0 since the turn of the year, but it may have been three losses leading into that streak that set the program up for a big year. Rogers took on three Class AA powers at the Schwan Cup Silver Division and lost to all three by identical 5-1 scores (Stillwater, Lakeville South and Burnsville). The Royals were bowed, but unbroken, and responded like a contender. Rogers doesn't have the firepower of Hermantown (3.08 goals per game), but is stingy in its own zone (2.36 goals per game allowed). Both Robby Vukelich (8-3-1, 2.07, .926) and Keaton Mumm (7-4-0, 2.13, .918) have been terrific in nets. Marchand's toughest task may be figuring out which to play on any given night. Bryan Jungles (14-22-36) leads the Royals in goals and points. No. 3 Proctor (16-7-2) and No. 4 St. Cloud Cathedral (15-9-1) are also plenty dangerous. The Rails suffered through injuries to its top scorers, but look healthy entering section play. Keep an eye on Justin Scanlon (23-20-43), big Ian Ecklund (15-21-36), Tyler Pionk (14-18-32) and offensive defenseman Cody Gauthier (11-17-28). Meanwhile, the Crusaders had won the previous two Section 5A crowns until Hermantown knocked them out last winter. Diminutive senior TJ Bruce (11-33-44) leads the team in points, while freshman Austin Poganski (22-13-35) is the top goal sniper. For the rest of the contenders, let's play the name game. No. 5 St. Michael-Albertville (11-10-4) is paced by a pair of Jakes, leading scorer Jake Larson (26-18-44) and goaltender Jake Adams (8-8-3, 2.74, .908). No. 6 Princeton (7-15-2) actually finished ahead of the Knights in the Mississippi 8, though. And one last note. You're not seeing double (or triple, or quadruple) if you notice a few Cisars and Gasserts on the roster for No. 7 Moose Lake Area (17-7-1). The Cisar family boasts of four of the top five scorers, Tyler Cisar (with a school record 44-31-75), Zach Cisar (18-42-60), Josh Cisar (19-26-45) and Jake Cisar (10-18-28). The next three spots? All Gasserts with Chris Gassert (12-18-30), Michael Gassert (6-6-12) and Stephen Gassert (4-6-10). Despite losing 14 seniors from the Class A runner-up, Hermantown doesn't seem to have missed a beat. Credit longtime coach Bruce Plante and a talented group of seniors, such as forwards Garrett Skrbich and Jared Thomas and defensemen Brian LeBlanc and Jared Kolquist. The Hawks are a prohibitive favorite again in Section 5A, although much of their offense does come from Skrbich and Thomas, who have 59 goals combined. No other player has more than 10 (Bo Gronseth). Are the Rails healthy? If so, watch out. Proctor has enjoyed one of its best seasons in school history despite taking more than its share of injuries. At times, Proctor was missing its second and third leading scorers (big Ian Ecklund and Tyler Pionk), cutting into its depth. Yet the Rails continued to find ways to win. As the No. 3 seed, Proctor has a chance to get back to the state tournament for the second time in school history.